It is important to remember that, even in the face of stifling oppression, African Americans in the South built for themselves vibrant, resilient communities, where life could be lived with joy and grace. 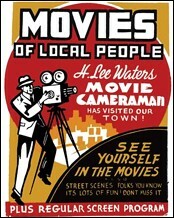 For a portrait of one, we turn to a film by H. Lee Waters (1902-1997). Waters, a white man, ran a photography studio in Lexington, North Carolina. During the Depression, when his business flagged, he took to the road with a movie camera, recording small-town life in the Carolinas, Virginia, Tennessee, and Georgia. Like other itinerant filmmakers, he would set up his camera in a key location—in front of a mill, at a school, on a main street—and, for the most part, film people passing by. He would then book the local theater, or the two segregated theaters, where, for the price of a ticket, the townspeople could see themselves on screen. By watching his films with the locals, monitoring their reactions, and basing subsequent films on what worked and what did not, Waters developed a particular style. He shot his films largely outdoors, usually in black and white, with no sound track. Since people paid to see themselves, their relatives, and friends, he built his films around close ups and shots of people strolling past the camera. He knew townsfolk would turn out to see their children, so there are many scenes of kids playing, fondling pets, and eating ice cream. In a few cases he showed people at work. For comic relief he would occasionally invert a shot, speed up the film, or run it backwards. Waters was not a devotee of the hidden camera; his subjects were well aware they were being photographed. Thus his films are exercises in self-presentation. As in home movies, some subjects pose eagerly, others reluctantly. Some mug for the camera; others shy away altogether. He often shot both white and African American subjects. Even though he sometimes showed his films in segregated theaters, he typically screened scenes of black and white life together. Recording unremarkable comings and goings, he offered a town a familiar, reassuring image of itself. In 1940 and 1941 Waters took his camera to the piedmont mill town of Kannapolis, North Carolina, where he filmed both black and white residents. In effect, he recorded two separate communities, each of which he defined largely through the public space it claimed. His portrayal of the white community focuses chiefly on the textile mill and on the town's bustling commercial district. When he turned to the African American community, he shot some scenes in what appears to be a black commercial district, but for the most part he filmed in residential areas. It is illuminating to consider Kannapolis, N.C. in the context of work done by many American artists, writers, and photographers at this time. Critic Alan Trachtenberg has pointed out that the economic upheaval and international tensions of the 1930s and '40s stimulated "a mass desire for reassurance." People yearned to "return to basic values, to fundamental Americanism," which they located in "the everyday life . . . of 'the people. '"1 Responding to that desire, many photographers documented day-to-day existence in images that suggested the fundamental soundness of "the American Way of Life," a term, Trachtenberg notes, that came into popular use during this period. Waters's films are part of this documentary tradition. Sitting in a theater's darkness, the residents of Kannapolis, black and white, could take comfort in the familiar routines of their lives enlarged and validated on the big screen. But even in Waters's Kannapolis of busy streets, well-stocked stores, and lively children there is a threat: in one scene newsboys display papers headlined "Shore Guns Batter British Coast; Italy Openly Warns Greece of Invasion." Citing evidence from the film, how would you characterize the economy of white Kannapolis in 1940-41? of black Kannapolis? How are class differences marked in the white community? in the black? According to the film, what are the values of the white community? of the black community? How does the film illustrate the values of each community? According to the film, what constitutes white public space, black public space? How do they differ? How do the public spaces available to the town's black and white residents define their communities? What does the film suggest about race relations in Kannapolis in 1941? What image of the Jim Crow South does the film present? How do the self-presentations of Waters's black and white subjects differ? How are they similar? Images: (1) Poster, Movies of Local People; (2) African American girl, still from Kannapolis, N.C. Digital images from Colorlab, New York City. Permission pending. 1Alan Trachtenberg, Reading American Photographs (New York: Hill and Wang), 247-248.